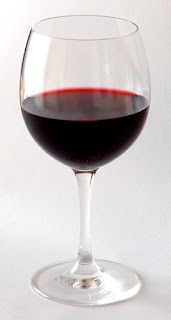 As with great wine, Northwest weather has its subtleties, some of which are interesting or even beautiful in their own way, even if they don't produce severe or exciting weather. Yesterday was a good example. 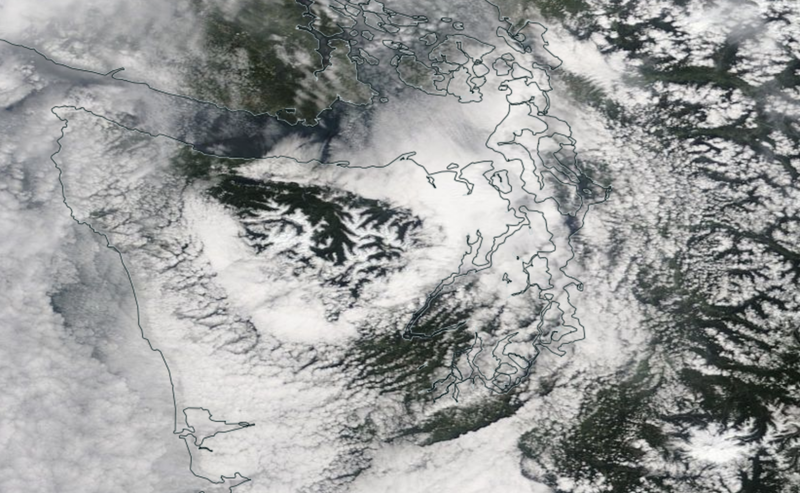 Below is the high resolution NASA MODIS imagery around noon Sunday that was centered on the Olympic Mountains. Do you see the the ring of low clouds around the Olympics? And some of that rink of clouds extends northeast of the Olympics. Why does it exist? As an aside, over the high, central Olympics you can see the dendritic pattern of snow on high terrain. Snow is also obvious on the higher ridges of the Cascades, with Mt. Rainier in the lower, right corner. The Pacific is covered with low clouds, with plenty of low, broken clouds pushing into western WA. A suggestion of what may be going on is found from the surface winds around the same time as the image. 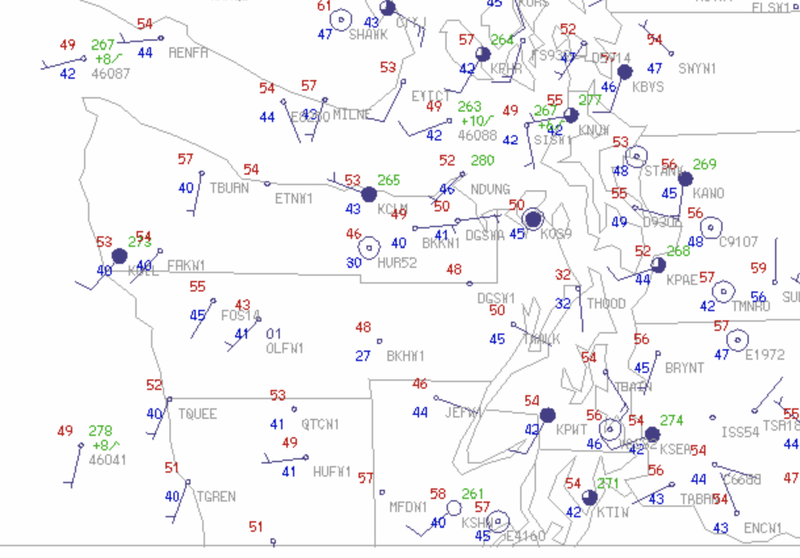 There is weak southwesterly flow approaching the Olympics along the coast, with cool cloudy air moving eastward into the Strait of Juan de Fuca to the north and south of the Olympics across Shelton and Bellingham (KSHN and KPWT). But look closely. To the southeast and northeast of the Olympics, there is air moving TOWARDS the Olympics. This is important. 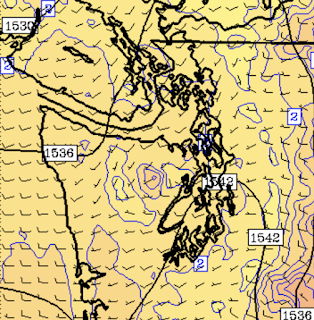 The flow at 850 hPa (about 5000 ft) at the same time shows westerly flow approaching the Olympics and being deflected by the roughly circulation barrier. And the forecast relative humidity at the same time at the same level shows a ring of high values (lighter shading) surrounding the Olympics--this looks a lot like the ring of clouds shown in the satellite picture. 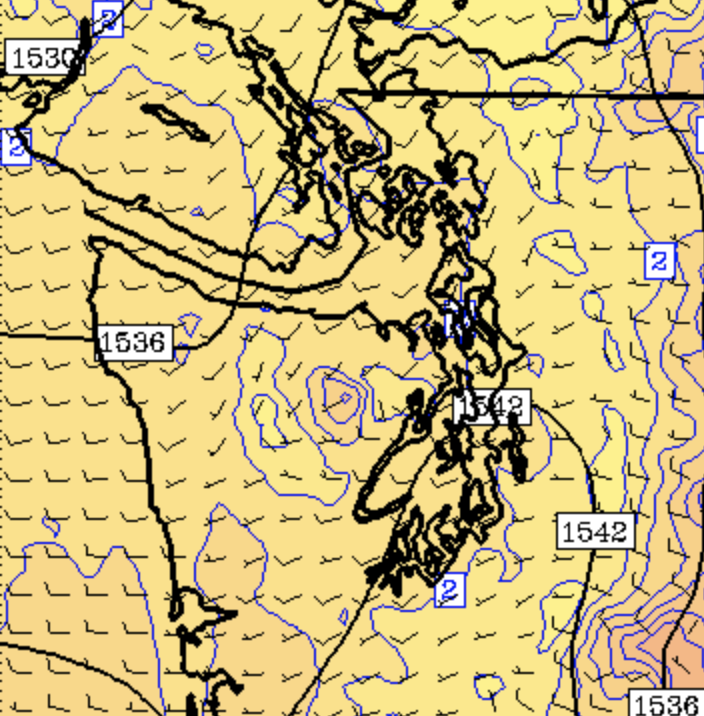 Now let's look at the surface winds and sea level pressure (brown lines) forecast by the UW WRF model at 1 PM Sunday. Pressure was relatively lower in the Olympics and higher in the cool, dense marine air circling around the barrier. Look real close and you will see upslope flow (air moving towards the high Olympics) at low levels in a ring around the barrier. That upslope flow produced additional cooling the enhanced the low clouds and also made them deeper in the ring around the mountain barrier. That was the origin of the ring. But with our fancy, high resolution models we can do much more. We have full three-dimensional data, like a 3D meteorological CAT-scan. 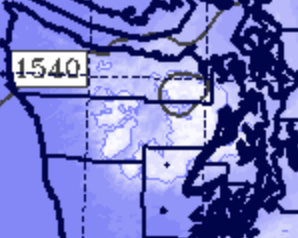 Let's do a vertical cut or cross section SW-NE across the Olympics (see below) at 11 AM Sunday. Clouds are shown by the color shading. You can see the ring. Winds in the cross section are shown by the wind arrows. Relative humidity by the red lines and the blue lines are temperature (something called potential temperature). Aloft, some air was moving up and down the upper slopes of the Olympics, with enhanced downward flow on the NE side of the Olympics contributing to lower pressure there. But you can see the tongues of cooler, cloudy air rising on both sides of the Olympics, particularly on the NE side. So we had weak, flow coming off the Pacific from the west and southwest; this cool, cloudy air pushed around the barrier. 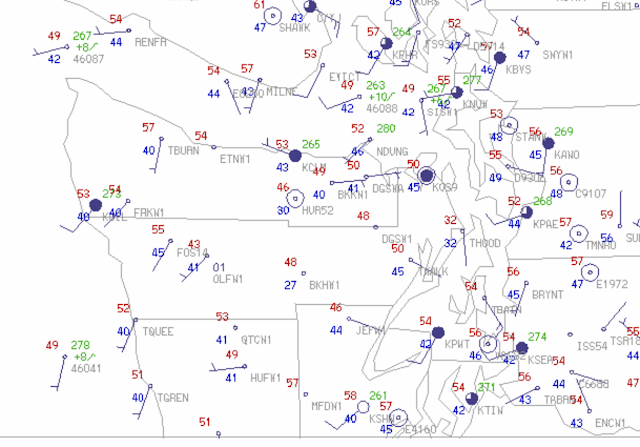 A difference in low-level pressure between relatively high pressure in the cold, dense cloudy air and lower pressure produced by downslope flow on the barrier, helped generate upslope flow for the north to southeast quadrants of the barrier. Just plain upslope flow was observed on the southwest side of the barrier. A subtlety perhaps. But for connoisseurs of local weather, an example of the kind of fine detail that our modern tools can reveal.